Wow, what a great afternoon. 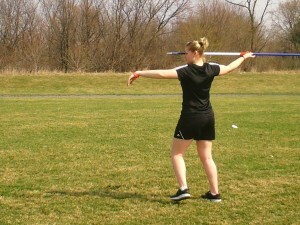 I finally got the chance to throw my new javelin outside!!!! This week and next week are extra busy with school activities which hasn’t allowed me to train at all. I have to admit I was exhausted and really sore after my TKD test last weekend so a few days off was probably good for me. I can still hardly hold my pencil to write after all the knife hand breaks and my right foot is still really bruised from the board breaking in my test. 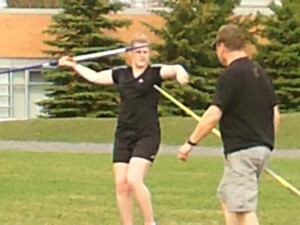 When Bill offered to come to my school during my lunch hour to get in some Javelin training I jumped at the opportunity. It was soooo thoughtful of him since he knew that I couldn’t make it to the evening training sessions this week. 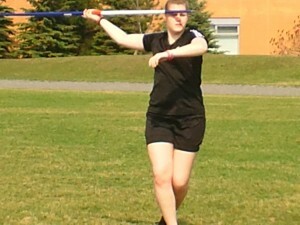 It felt really different throwing outside again. Bill had some new warm up and throwing drills for me. I loved the feeling of running fast on my run up and then just letting it go. Controling the speed is the hardest part. It’s probably the most frustrating sport and it takes a lot of patience… I love it 🙂 I can’t wait until the next time I get to throw. For now, when I am throwing on a field I cant wear my spikes so it feels awkward going back to running shoes. My dad came to video my training so Bill could critique it. He uses an overlay with a ‘stick man’ so I see if my form is right. I always find that analysing videos is a great way to make corrections. Thanks again Bill for coming out. I REALLY appreciated it. Once the school play is over at the end of next week I will be back to my regular training sessions. I miss my routine of training 🙂 Track at school starts next week and I am really excited! 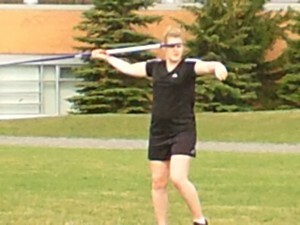 I have a few other friends who are going to try javelin this year. It should be lots of fun.